Missiles can be classified as the aerodynamic or the ballistic missiles, An aerodynamic missile is one equipped with wings, fins, or other structures that allow it to maneuver as it travels to its target, Aerodynamic missiles are known as cruise missiles, Ballistic missiles are missiles that follow a free-fall path once they have reached a given altitude, The ballistic missile travels at a velocity less than that needed to place it in orbit, therefore, follows a trajectory (a curved path) back to Earth’s surface. The missiles can be classified according to the place from which they are launched & the location of their final target, An air-to-air missile is one fired from the air (usually from an aircraft) with the objective of destroying another aircraft, The surface-to-air missile is one fired from a ground station with the goal of destroying aircraft, The antiship and anti-submarine missiles can be launched from ground stations, from the aircraft, or from other ships. Missile technology is proliferating fairly rapidly, missile ranges are increasing, producing & deploying missiles is cheaper and less complicated than establishing & maintaining a force of modern combat aircraft, Missiles are more concealable than aircraft, more effective in penetrating defenses, and, potentially at least, more accurate. Any missile consists of four parts: The body is known as the airframe, the propulsive system, the weapon, and the guidance system, The propulsive systems used in missiles are the same as those described for rockets, they consist of one or more liquid rockets, one or more solid rockets, or some combination of these. 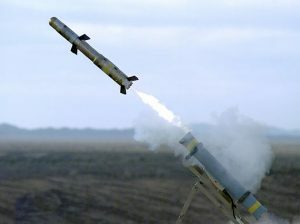 The missile is the unmanned vehicle propelled through space, usually carrying some type of explosive device intended to do harm to an enemy, The missile, like the rocket, carries its own means of propulsion, It may carry its own guidance system or, it may be guided by a ground-based command center. The missiles can carry any kind of high-explosive, chemical, biological, or nuclear weapon, Anti-tank missiles, as an example, carry very high-powered explosives that allow them to penetrate a 60-centimeter (24-inch) thick piece of metal, The rockets are used as components of missiles, A large fraction of the research & development on modern rocketry systems has been carried out or supervised by the military services. The term rocket is used in two different ways, it is used to describe a jet engine that does not depend on air for its operation but instead carries its own fuel & an oxidizing agent, and it is used to describe any vehicle that is powered by a rocket engine, The fireworks device is a kind of rocket engine, It contains the fuel and oxidizing agent needed to put it into the air as well as the chemicals needed to give the colored display typical of fireworks. Nuclear weapons become popular for use in missiles, due to the destructiveness of such weapons, and the anti-missile jamming programs are good enough to make it difficult for the most sophisticated guided missile to reach its target without interference, Nuclear weapons cause the destruction over a wide area, however, that so-called defensive jamming is less important than it is with more conventional explosive warheads. The methods used to guide the missile to its target were relatively simple, One of the most primitive of these systems was the use of a conducting wire trailed behind the missile and attached to a ground monitoring station, Another guidance system is the use of the TV camera mounted in the nose of the missile, The camera is pre-programmed to lock in on the missile’s target, The electronic & computer systems can then keep the rocket on its correct path. The rockets have two primary functions, they are used to carry out research on Earth’s atmosphere, other parts of the solar system and outer space, The rockets designed to carry the instruments no farther than the upper levels of the atmosphere are known as sounding rockets, Those designed to lift spacecraft into orbit or into outer space are known as boosters or as carrier vehicles. The operation of the rocket is based on Newton’s third law of motion, every action is accompanied by an equal and opposite reaction, The rocket is propelled in a forward direction when the fluid is expelled from the back of its body, In the most common type of rockets, the expelled fluid is hot gases produced by the chemical reaction inside the body of the rocket. In other types of rockets, the expelled fluid may be the stream of charged particles, or plasma, produced by the electrical, nuclear, or solar process, Binder is the material used to hold the fuel and oxidizer together in a solid-fuel rocket, Booster rocket is a rocket designed to lift a spacecraft into orbit or into outer space, Carrier vehicle is another name for a booster rocket. Liquid-fuel rocket is a rocket in which both fuel and oxidizer are in the liquid state, Plasma is a mass of very hot charged particles, Solid-fuel rocket is the rocket in which both fuel and oxidizer are in the solid state, Sounding rockets are the rockets designed to travel no farther than the upper levels of Earth’s atmosphere. Liquid-fuel rockets have a number of benefits, they can be turned on and off rather simply by opening and closing the valves that feed the two components to each other, they tend to provide more power than do solid rockets, when problems develop in the liquid-fuel rocket, they tend to be less serious than those in a solid-fuel rocket. In the solid-fuel rocket, the fuel and oxidizer exist in the solid, rather than the liquid state, The combination of fuel and oxidizer, along with a binder to hold them together, is called the grain, The grain has a clay-like texture, When ignition occurs, the oxidizer reacts with the fuel to produce hot gases that propel the rocket in the same way as with liquid rockets. The solid-fuel rocket can be fueled a long time in advance of the launch without much danger of the fuel’s deteriorating or damaging the rocket body, The construction of the rocket body needed to accommodate the solid fuel is much simpler than that needed for the liquid-fuel rocket, the fuels in the solid-fuel rocket tend to be safer and easier to work with than those in the liquid-fuel rocket. Nonchemical rockets operate with the solid and liquid chemicals are the only kinds currently in use, The nuclear-powered rocket would carry a small nuclear reactor, the heat from which would be used to vaporize hydrogen gas, The hydrogen gas expelled from the rear of the rocket would provide its propulsive force, The nuclear rocket has a lifting force more than twice that of the traditional chemical rocket. Liquid-fuel rockets have a number of serious drawbacks, the liquid components require very special care, The liquid fuels must be added to the rocket just before its actual ignition since the components can’t be stored in the rocket body for long periods of time, the mechanical demands needed for the proper operation of the liquid-fuel system can be very complex, So, subject to a number of possible failures. The solid-fuel rockets have their own disadvantages, Once the fuel in the solid-fuel rocket begins to burn, there is no way to slow it down or turn it off, So, some of the most dangerous accidents that can occur with the rocket are those that involve solid-fuel combustion that gets out of control. Missile proliferation brings other dangers, Missiles used for satellite launch and space exploration, can be used as long-range surface-to-surface missiles, Both space launch missiles and long-range surface-to-surface missiles can be used to threaten the increasing deployment of observation and communications satellites orbiting around the earth and providing invaluable services to military and civilians alike. Space-orbiting anti-satellite (ASAT) weapons would be a serious threat to communications and observation satellites, but they must be placed in orbit by ground-based missiles, which remain the cheapest and most effective ASATS, Missile defenses are a logical stage in the development of weapons in space, Missile proliferation has resulted in a further significant negative development in nuclear strategy.